A CYCLIST illegally riding on a T-Way lane in Sydney's northwest followed a bus, boarded the vehicle at a bus stop and then bashed the 64-year-old driver.Police are investigating the incident, which took place near the intersection of Powers Rd and the Northwest Transitway, Seven Hills about 5.05am on Friday, and searching for the cyclist. Police said the driver overtook the cyclist, who then pulled up alongside the bus at the next set of lights, banged on the bus window and broke the driver's mirror. "At the next bus stop the rider entered the bus and allegedly assaulted the driver," a police spokesman said. It is the latest in a series of violent incidents between drivers and cyclists, who are illegally using the T-Way. 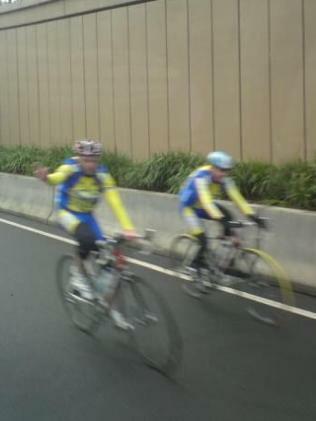 The RTA has acknowledged that illegal cycling on the T-Way is rife, saying it was in the process of installing 61 "no bicycle signs" along the North West Transitway, in addition to signs already in place.Motorists caught on camera using the purpose-built bus lanes, which begin at Parramatta, are fined $220 each but the RTA has no way of tracking down cyclists. The cyclist was caught on CC-TV wearing a blue helmet and bike clothing and is described as white/European in his 30s and about 178cm tall. Transport Workers Union spokesman Darcy Waller said the cyclist "got all upset because the bus overtook him" on a road he shouldn't be using. "He was dressed like Cadel Evans and still wearing his helmet as he pushed past a woman and started throwing punches at this driver." The RTA said it would be "taking part in discussions" with Hillsbus and union delegates in the next fortnight in a bid to stamp out the cycling problem. thugs, that just discusts me. I believe bikes using the road should be registered vehicales. Sounds like the bike dude got out on the wrong side of bed, or it's happened to him eleventy billion times before. I'd never ride my bike on a busy road, but I sometimes do think registering your bike (maybe even for identification purposes) if the worst was to happen is a good idea. Yeah because since cars have had to be registered no one ever does stupid stuff in them.